These numbers are based on costs for the 2018-2019 school year. Amounts will change slightly from year to year, but as the cost of college increases, the scholarship packages will correspondingly increase. Funding awarded from outside sources will reduce student work expectations. Depending on the amount of the outside award, the Grinnell QuestBridge Scholarship may be reduced. In addition, total grant/scholarship assistance from all sources can never exceed the College's total published cost of attendance. The grant from Grinnell will be increased by the estimated cost of travel based on the student’s permanent home address. However, students are expected to pay for travel to and from campus as part of their contribution from summer work and/or academic year earnings. Students should also be prepared to pay for books and personal expenses from summer earnings and academic year earnings. Grinnell College requires all students to be covered by a health insurance policy. If a student is not covered by a health insurance plan, then s/he is required to participate in the College's health insurance program; a loan is available to cover participation fees: $1,687 for 2018-19. Students must remain in good standing for each term they are enrolled. There is no specific GPA required to maintain the QuestBridge Scholarship, other than the minimum to remain in good standing. Maximum timeframe for receipt of scholarship is eight semesters. Need-based student loans are available if students wish to borrow to replace the summer work and/or the Campus Employment expectations. The summer earnings expectation for all students (first - fourth years) is $2,500 annually. The Student Savings contribution is calculated based on the student's assets. Grinnell College is "need blind" for all domestic applicants. Percent of students receiving aid: 87%. 100% of the students receiving aid had their institutional need fully met. Average financial aid package to students demonstrating need: $47,058. 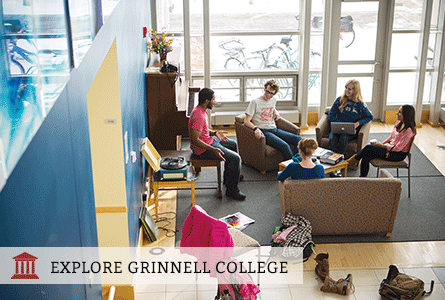 Use Grinnell's Net Price Calculator to estimate the financial aid for which you are eligible.